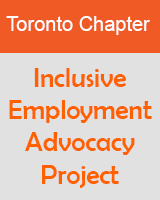 The Inclusive Employment Advocacy Project equips job-seekers with disabilities to better self-advocate for our equal access to employment services and programs. In 2018, we are putting the training into practice through a mentorship program. We are recruiting 12 mentor-mentee pairs to approach employment service providers to enhance their services for job-seekers with disabilities. We will also expand our resources and tools to be used by other disability groups, as well as establishing partnerships with community organizations, services, and businesses to enhance their advocacy for employment of people with disabilities. If you meet the characteristics of being a mentor or mentee described below, we welcome your participation in this program. To become a mentee, you are a job seeker with a disability (physical and/or medical, sensory- blind or visually impaired, deaf or hard of hearing, mental health conditions) and are between 24 and 50 years old, and interested in receiving support and guidance from experienced employed individuals with disabilities in order to achieve your career goals. Here is the final report for year one of the project. Here is a word version of the year one report.